I love shoes, especially ones that make a statement. 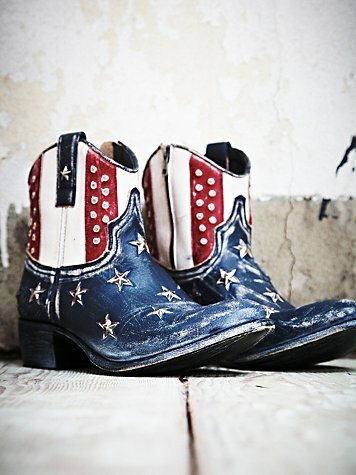 So, when my friend showed me these Americana boots, I knew they would make a great addition to my closet. Unfortunately, a $650 price tag is just a little out of my reach. The DIY-er in me said, “Hey, you could make those!” For less than $60, I created my own version of this patriotic footwear with a flair! This project was really easy, just a little time-consuming. The end result is totally worth it! I started by taping the soles of my boots to prep them for painting. Then I tried this Acrylic spray paint for the first time, and I loved it. It is specially formulated to use on flexible surfaces, it is weatherproof, and the coverage is great. It came in a ton of colors too… I’m thinking next time I might go for some yellow boots! and dry-brushed it over the top. It created great texture and dimension. Then, I was ready to paint the stripes, which turned out to be the hardest part for me… luckily, you can learn from my mistake! First, I free-handed all of the stripes, but they were a little too thin and didn’t look great. So I decided to tape them off and try again. The painters tape worked much better! I peeled the tape up when the paint was wet and cleaned up any mess on the edges with a baby wipe. 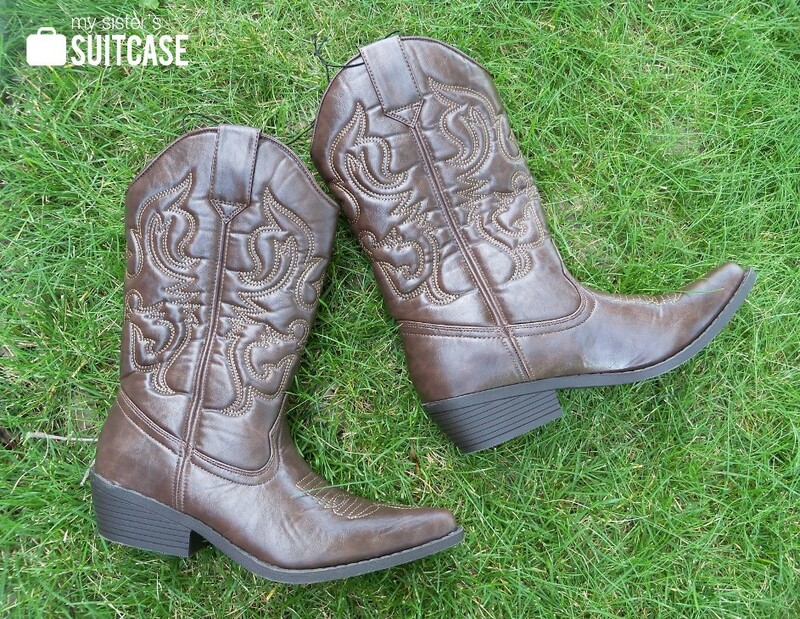 When the paint was dry, I started distressing the boots to make them look more aged. 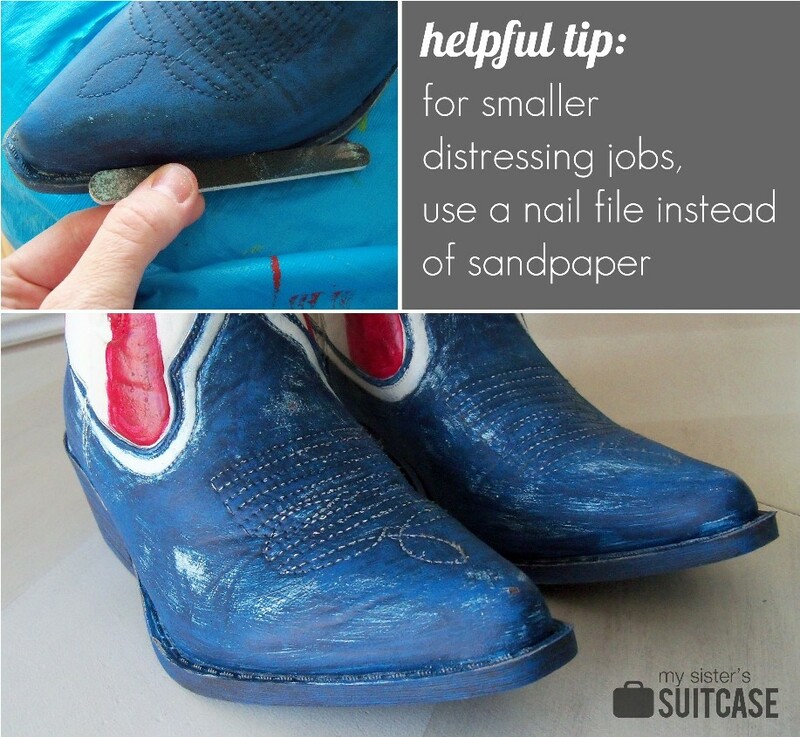 I used a nail file to get the edges of the boots… it works great for sanding in tight spots! Now I was ready to add my metal “stud” stars. I found these metal accents and painted them silver. The final step was to add some spice to the red stripes. For added depth, I brushed the same black glaze over the stripes, and wiped most of it off with a baby wipe. Then, I created my own metal “studs” with some scrapbooking embellishments I had on hand. What a fun way to show that I’m proud to be an American… especially with the Olympics under way! Check out our other Olympic projects at My Sister’s Suitcase.